The regiment was formed as 104 Light Air Defence Regiment Royal Artillery (Volunteers) in 1967. Its units were 210 (Staffordshire) Light Air Defence Battery at Wolverhampton and 211 (South Wales) Light Air Defence Battery at Newport. In 1969, 214 (Worcestershire) Light Air Defence Battery at Malvern joined the regiment. It was renamed 104 Air Defence Regiment Royal Artillery (Volunteers) in 1976. In 1986, 214 Battery was formed at Worcester and 217 (County of Gwent) Air Defence Battery was formed at Cwmbran: both joined the regiment. In 1992 217 Battery was merged into Headquarters Battery and in 1993 the regiment was renamed 104 Regiment Royal Artillery (Volunteers). Meanwhile, 210 Battery moved to 106th (Yeomanry) Regiment Royal Artillery. 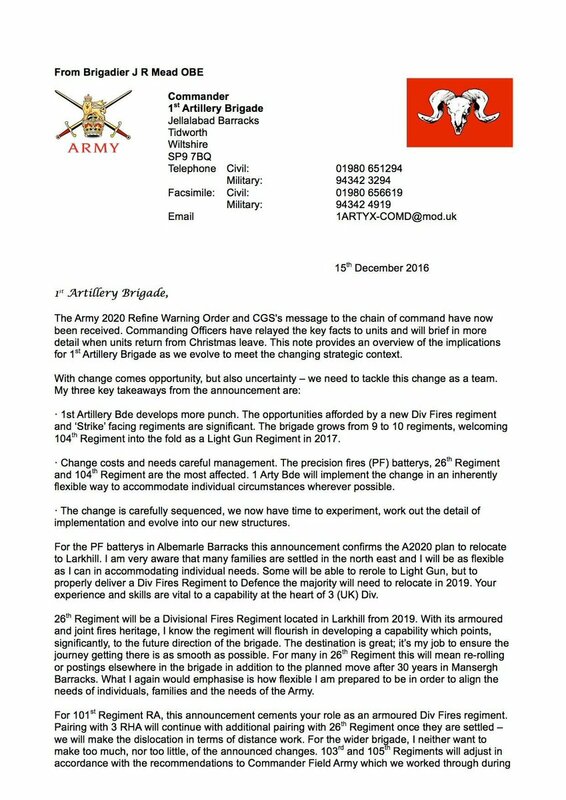 Under Army 2020, 266 (Gloucestershire Volunteer Artillery) Battery Royal Artillery joined the regiment from 100th (Yeomanry) Regiment Royal Artillery. In 2017, it converted to a light artillery gun regiment. ^ a b c d e f g "Royal Regiment of Artillery, Volunteer Regiments". Archived from the original on 12 December 2008. Retrieved 11 May 2014. ^ "210 Battery". Archived from the original on 2015-07-14. Retrieved 11 May 2014. ^ a b "Summary of Reserve Structure and basing changes" (PDF). Archived from the original (PDF) on 10 August 2013. Retrieved 11 May 2014. ^ "Letter from Brigadier Mead". 1st Artillery Brigade and Headquarters South West. Retrieved 16 December 2016. ^ "104 Regiment Batteries". Retrieved 23 December 2016.